This is an A5 size page for a Circle Journal (one of three). In order to get myself crafting more, and spending less time faffing about I've committed myself to a couple of projects. The first is to take part in a Circle Journal based on the "Wheel of the Year" with some friends in the US. Rather than posting big bulky books around, we'll make 3 pages for each of the festivals and send those to each other instead. We'll be starting with the upcoming Solstice, and this is the first page. There's another to follow. 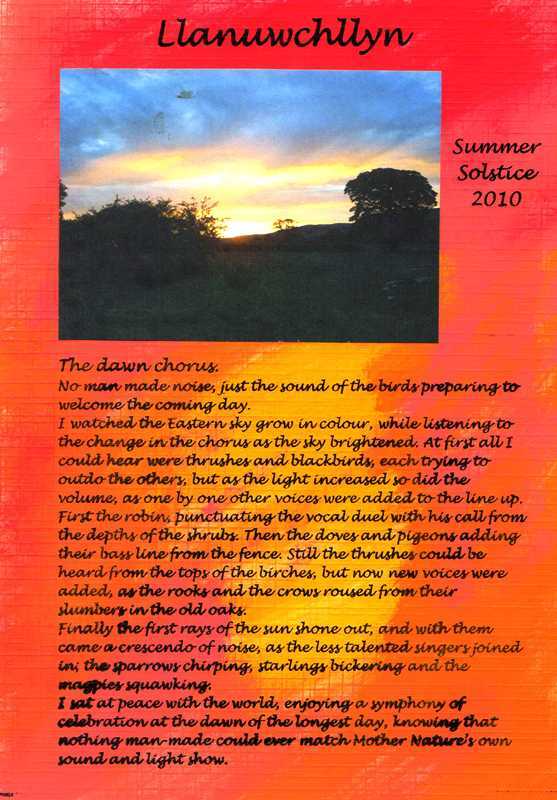 The photo was taken on the Solstice last year at Llanuwchlynn. The words are my own, and are below (easier to read). The second step towards more creativity is to join in an online workshop - Marit's Creative Summer Camp. We started yesterday and this is my first piece inspired by one of the prompts. No man made noise, just the sound of the birds preparing to welcome the coming day. I watched the Eastern sky grow in colour, while listening to the change in the chorus as the sky brightened. At first all I could hear were thrushes and blackbirds, each trying to outdo the others, but as the light increased so did the volume, as one by one other voices were added to the line up. First the robin, punctuating the vocal duel with his call from the depths of the shrubs. Then the doves and pigeons adding their bass line from the fence. Still the thrushes could be heard from the tops of the birches, but now new voices were added, as the rooks and the crows roused from their slumbers in the old oaks. Finally the first rays of the sun shone out, and with them came a crescendo of noise, as the less talented singers joined in; the sparrows chirping, starlings bickering and the magpies squawking. I sat at peace with the world, enjoying a symphony of celebration at the dawn of the longest day, knowing that nothing man-made could ever match Mother Nature’s own sound and light show. So glad I found you through the “All Kinds of Artists” Artist blog hop! 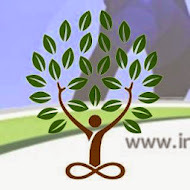 Good idea to join an online workshop. I think they must help people like us to think outside of our range of art activities and will help development of ideas and skills. Good golly Nigel...your writing is fabulous! I have heard just such bird sounds but could never put it into such beautiful words AND then there's your art piece! Very cool that you've join in with Marit...she is a dear and oh so talented too!